Incomparable in its scenic beauty, the lofty mountains and deep valleys of Karakoram, Himalayas and Hindukush offer unique opportunity to experience the varied shades of nature in the most adventurous way. The Northern Areas of Pakistan come to be known as a paradise for adventure and nature lovers. Trekking in Pakistan is most popular among the tourists all over the world. The area is ideal for mountaineering, trekking and nature watching. The place is ideal for those who want to discover a peace of mind. One can enjoy the unspoiled and pollution free natural beauty of the land. Located in northern Pakistan, on the border with both China and India, the Karakoram is a vast and complex mountain range which includes the greatest concentration of big peaks in the world. 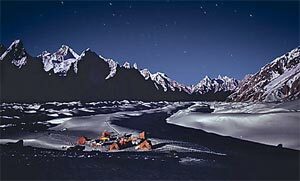 KE pioneered treks to the Karakoram in the early 1980's and established many superb routes amongst the spectacular high valleys and glaciers of this unspoilt mountain group. The classic approach to K2 and Concordia, the challenging trek to K2 by way of the Gondoro La and the magnificent crossing of Snow Lake and the Hispar La are absolute classics of world trekking. The northern areas of Pakistan are blessed with some of the worlds most rugged and splendid mountain scenery. This vast land of eternal snow is the abode of five of the worlds major 8, 000 meter peaks. 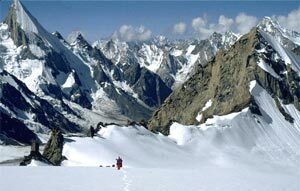 K-2 pronounced as (Chogori) in Balti language is the jewel of the Karakoram range. Towards the western Himalaya lies Nanga Parbat the worlds ninth highest. Even today, these mountains are less well explored and mapped than other comparable mountain regions, and many peaks over 6000 meters remain unnamed and unclimbed. Not only does this region posses lofty mountains but some of the worlds longest glaciers outside the polar region. The Biafo and Hispar together form one of the longest traverses with possibilities of climbing innumerable peaks below 6500 meters. In no other part of the world is there such a large number of high mountains in such a confined space. This form of trekking is unique in itself unlike anything in the Americas, Europe or even elsewhere in Asia. Not only does one encounter mountain scenery in absolute wilderness but as you journey through valleys you come across some of the worlds rarest wildlife species and assemblage of plants. The Markhor, Himalayan Ibex, Shapu and Snow Leopard all survive in close proximity of these high mountain ranges. Trekking in the karakoram, Western Himalaya and Hindu Kush is a once in a life time adventure. Pakistan is a paradise for trekkers. Most of the trekking routes lies in the northern mountains of the Hindukush, the Karakorams and the Himalayas. For most of the treks, trekking season is between May to October. The Ministry of Tourism, Government of Pakistan, has defined trekking as walking below 6000 m. It has designated three zones for trekking.